Item number Na1351 from the MOA: University of British Columbia. Sitting creature with flipper-like legs out in front and hands up in front of chest. There is an oval area below hands. Hair streams back from face which has a ridged nose and brows, oval eyes and downturned mouth. 'Lucassie 69252' is scratched in bottom. Stickers read '167' and '#630'. 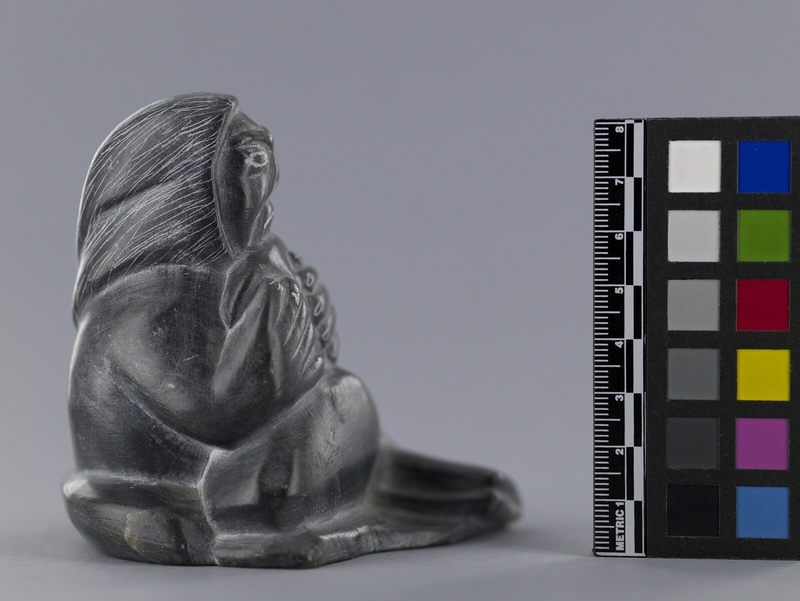 Contemporary Inuit sculpture produced for the art market began in the 1950's in response to a very successful sale, by the Canadian Handicraft Guild in Montreal in 1949, of pieces collected by James A. Houston on the east coast of Hudson Bay. The Inuit co-operatives developed by 1959 and a central marketing agency was established in 1965. 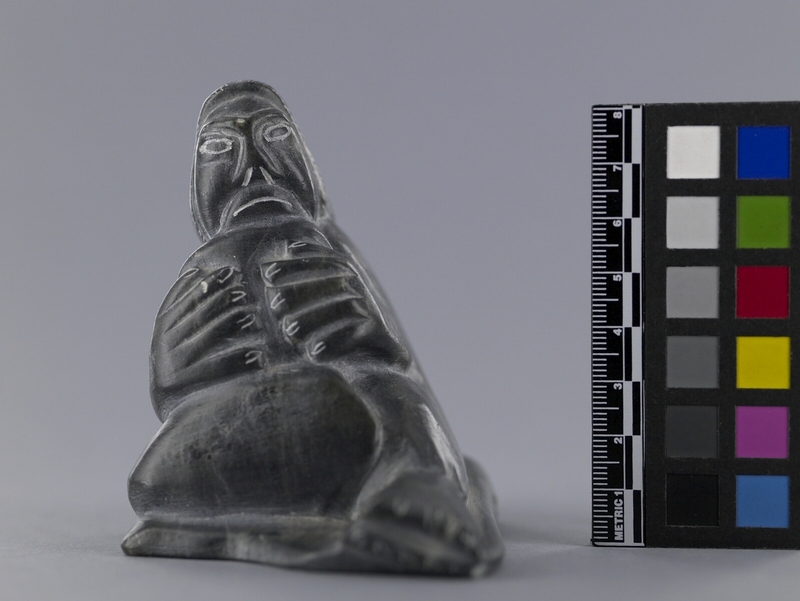 Carving continues to be a major source of income in the Eastern Canadian Arctic, an area which has undergone major social and economic changes, especially since World War II. There has been a steady growth in permanent settlements during the last half of this century which has made large scale carving in stone feasible. Traditionally, carving materials were mainly bone, antler, and ivory, because of their light weight, strength, and durability. 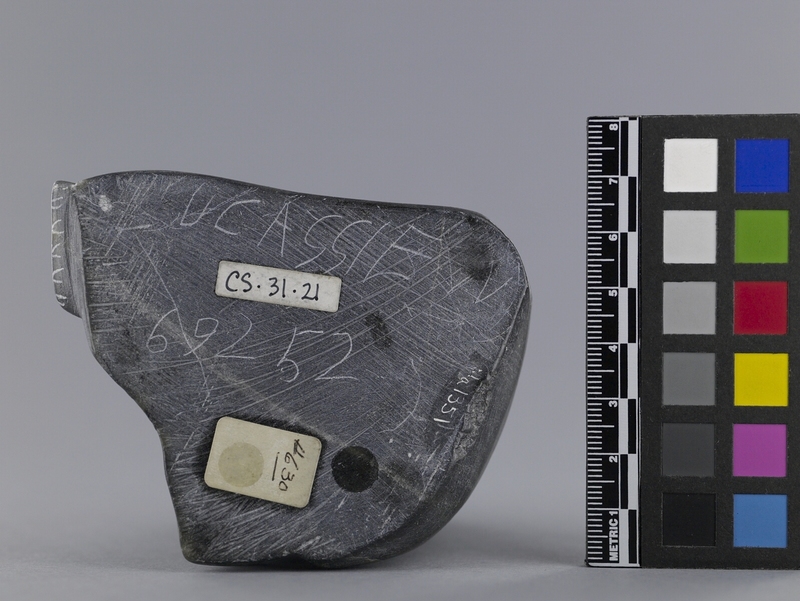 Heavier and more fragile stone was used primarily for lamps and cooking vessels. 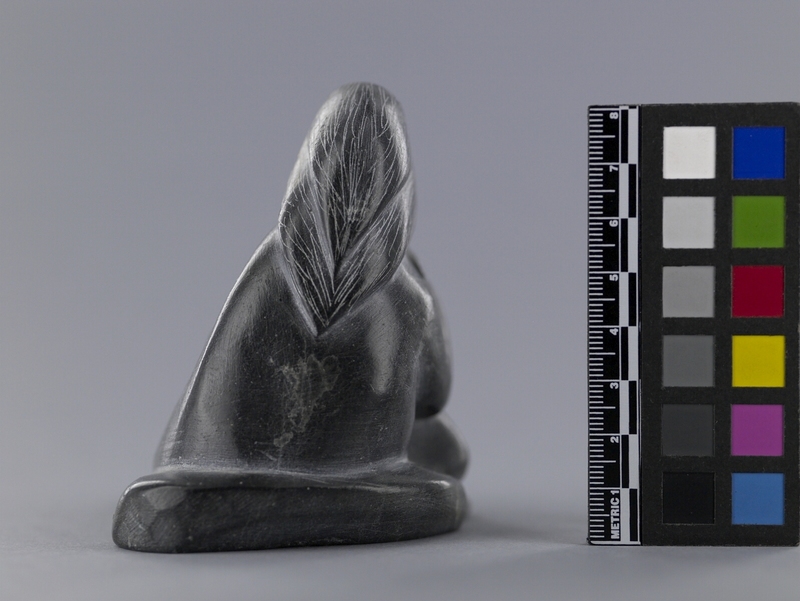 Although Inuit sculpture is often referred to as 'soapstone' sculpture, in fact, less than half of the stone used is soapstone (a high-grade talc or steatite). Other stones commonly used include serpentine, olivine, periodite, chrysolite, and others. In the early years of the industry it was possible to identify where a carving came from by the specific type of stone used, however, in recent years stone is traded on a wider, regional basis. Whale bone, antler, walrus tusk ivory, and a variety of other materials are also used by Inuit carvers. 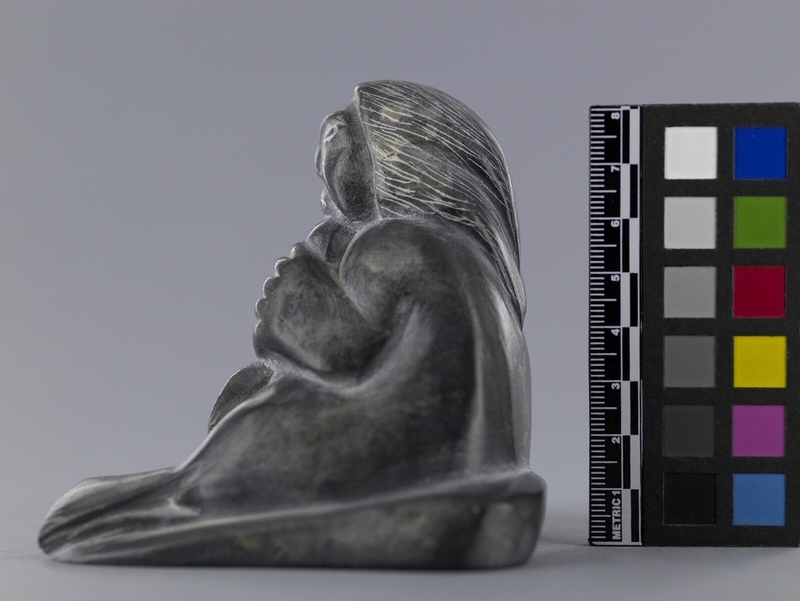 Themes in Inuit sculpture are based on personal experiences and beliefs, derive from oral traditions, mythology, as well as from narrative and figurative themes depicting arctic fauna and scenes of traditional Inuit life. Regional, community, and individual styles are also apparent.